Manager Ronny Deila has allayed fears that captain Scott Brown had aggravated a knee injury in Celtic's 0-0 draw at home to Kilmarnock. The captain returned to the starting line-up after missing four matches and was hobbling as the match ended. Deila reckons Brown will be fit for Thursday's Europa League tie with Ajax. "I asked him [Brown] and he said it was just a knock, so I think that will be good, it is nothing to do with what he had before," said Deila. Kris Commons missed Saturday's game through illness and remains a doubt for the must-win game against the Dutch league leaders. "It is a possibility," said Deila on the playmaker's chances of a return. "We will see on Tuesday how it is." 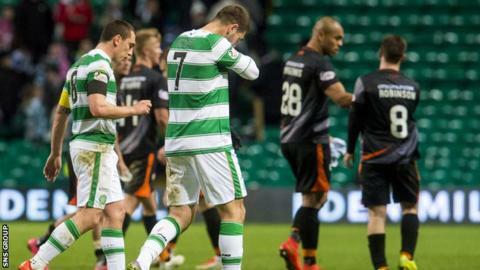 Celtic huffed and puffed against determined opponents, with the men from Ayrshire packing men in defence. "It was 90 minutes with 70 per cent possession, but there was a lack of tempo, creativity and timing in the last third of the pitch," bemoaned Deila. "We didn't create enough, even though we had chances and should have won the game. So it is very frustrating. "I think the boys had a good attitude, really wanted to fight and did everything they could, but the timing in the last third was not good and that has been maybe for the first time this year in the league. "But the positive is we had a clean sheet and I felt safe about that because of good defending." After picking up just two points from four Group A fixtures, Celtic have to win their final two fixtures against Ajax at home and Fenerbahce away to qualify for the knockout stages. And Deila is expecting "a totally different game" against the Dutch. "You can't compare this game to what is coming on Thursday," he said. "They are a team that is going to attack us and want to have control over the game, so there is going to be another approach from today." Kilmarnock boss Gary Locke, who revealed Rory McKenzie picked up a hamstring injury which led to him being replaced by Greg Kiltie just before the break, was "really pleased" with a second draw against the champions this season. "Everything we worked on all week, the game plan and the way we set up, worked a treat," he explained. "We could have nicked it in the end with a couple of chances on the counter attack, so I couldn't be happier with the performance. "If you open up against them too much they have got players who will hurt you. "We were well organised, worked hard and got a thoroughly deserved a point in the end."